↑ a b BirdLife International. «Phaethornis ruber». Lista Roja de especies amenazadas de la UICN (en inglés). Consultado el 7 de noviembre de 2015. ↑ Linnaeus, C. (1758) Systema Naturae ed.10 p.121. ↑ a b Ermitaño Rojizo (Phaethornis ruber) (Linnaeus, 1758); Avibase. 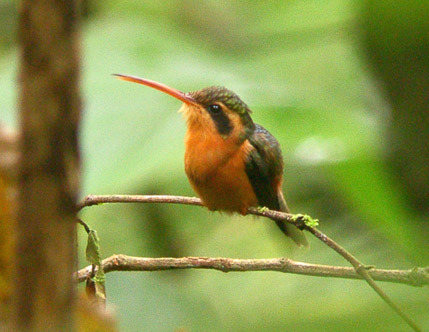 ↑ a b c Reddish Hermit (Phaethornis ruber); Planetofbirds. ↑ a b Schulenberg, Thomas S. (2007) Birds of Peru: 214. Princeton University Press. ↑ a b c d Rabo-branco-rubro; WikiAves. ↑ Perlo, Ber van (2009) A Field Guide to the Birds of Brazil: 65.3. Oxford University Press. ↑ Oniki, Yoshika (1970) "Nesting behavior of Reddish Hermits (Phaethornis ruber) and occurrence of wasp cells in nests"; The Auk 87 (4): 720-728. 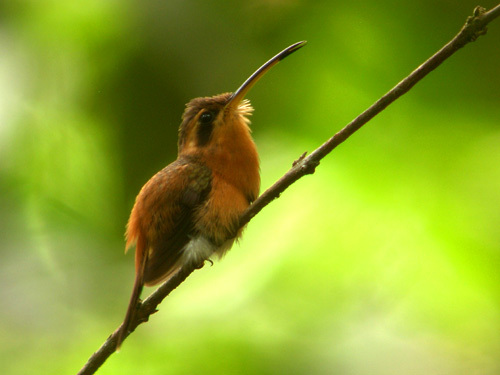 Wikispecies tiene un artículo sobre Phaethornis ruber. Esta página se editó por última vez el 25 nov 2017 a las 09:35.